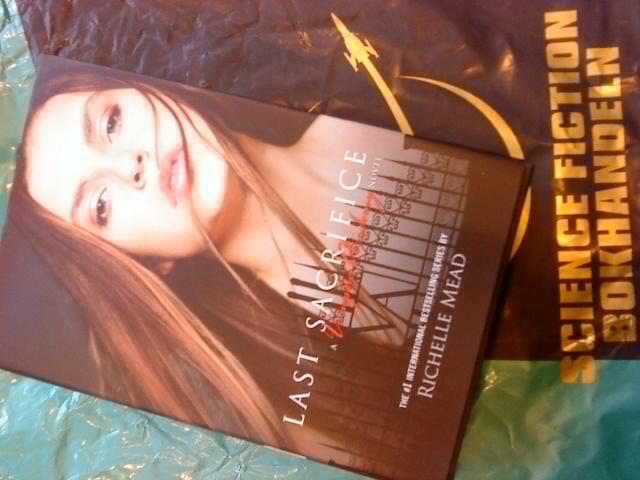 My friend Nina was actually lucky enough to pick up *drumroll* Last Sacrifice in store today!!! I've ordered my copy from an online bookstore, and according to them, they have the book in stock as well, so they should be sending it out soon. Of course I'm incredibly excited about that, but I really wouldn't have minded waiting another week to get the book. I'm just relieved that I hopefully will be able to avoid most spoilers before reading the book. This happened with Spirit Bound as well, and it's because the Swedish stores that import US and UK books don't usually wait for release day to put out the books. They have them on sale as soon as soon as they are delivered. Have any of you been able to find the book already? I know there are people who have gotten review copies, but this book was in a shop. Kanske borde börja läsa om de tidigare böckerna ur serien redan nu? Och kanske borde jag kommentera på engelska istället..